Bulls win South Division of the International League! No other team in the Division can possibly catch up over the next 12 games. Victory! 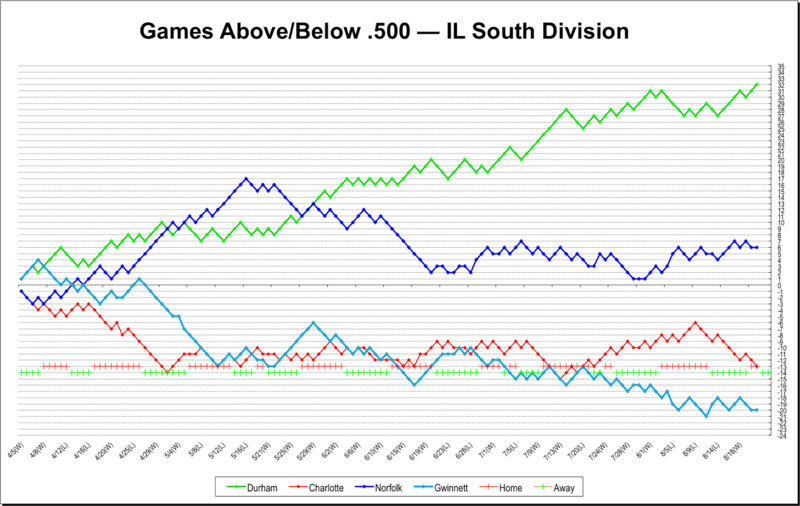 Even though winning the South has seemed inevitable for a long time, particularly when Norfolk fell off a cliff back in mid-June (see the chart below), this is a big deal for Bulls fans. From the photos floating around, that’s true for the players as well. They deserve the celebration. They have worked very, very hard to get to this end. This is the victory that matters in AAA ball. 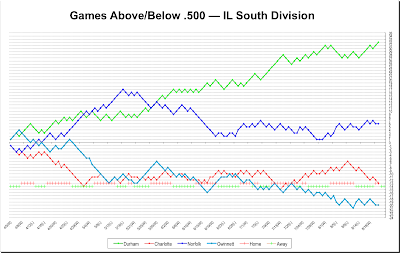 Yes, the Governors’ Cup is a great prize, but the teams who end up facing each other in the playoffs next month are likely to be quite a bit different from the ones who worked to get to the playoffs in the first place. The Knights were snakebit last night, giving up a bunch (5) of unearned runs. But credit the Bulls for some hard base running to help force the errors. When Shelley Duncan hit his home run in the 4th inning I finally noticed how much help he’s been to the team even without his usual power this year. He’s got 51 RBI, and that’s a big deal for a team of essentially patient singles hitters. Merrill Kelly looked particularly sharp last night, ending his 7 inning with an impressive striking out of the side. Frank De Los Santos, who last pitched on the 14th, got in two good innings to wrap it up. Even prettier, however, was the nice running catch of Kevin Kiermaier to end the game. WDBB favorite Elliot Johnson will be putting on an Atlanta Braves uniform and rejoining his former Bulls teammate B.J. Upton. Both of them came out pretty well in our look at all-time Bulls hitters last January. EJ was not having all that good a year with the Royals, but maybe he’ll find a better fit with the Braves. Hope so. Speaking of inevitability, the Bulls were even ready to go with the T-shirt.